Official Summary (add to Goodreads): Sebastian Stewart was never Mr. Dependable; he was more the good-time guy who only wanted to swim, party, and ink tattoos. Until he cost his team the Olympic gold four years ago. Bas is determined to do right this time around—by his medley relay team and his rookie mentee. Review: I love Layla Reyne, and I highly recommend her books. Medley is the second book in what I believe is a duology called Changing Lanes. 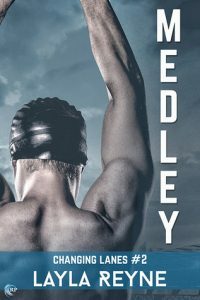 Readers meet Sebastian – Bas – and Jacob in the first book, Relay, which focuses on two other members of their Olympic swimming team. First off, I love the setting of the Olympics. I know we just had the Winter Olympics, and swimming is a Summer sport, but it was still fun to read this book around actual Olympic time. While you can easily read just Medley, as events in Relay are explained/summed up, I do think both books are really good, so it’s your choice! While I really liked Medley, and I would recommend the book, I do know that some readers might get frustrated with the back and forth between Bas and Jacob, though it’s really just Bas’ fault. However, it made sense to me because Bas is trying to make up for something he did in the previous Olympics and not let his team down, while also trying to take care of Jacob, who is a first time Olympic swimmer. When it’s obvious that Jacob wants more, Bas has a hard time saying no – because he wants more too. However, he also thinks he’s going to ruin things for his teammates if he gives in too much, so it’s a lot of pushing Jacob away, believing Jacob is better off without him anyway, since he has so much still ahead of him (there is a bit of an age difference here; Jacob is 19 and Bas is later 20’s I believe). Despite the back and forth, I was still intrigued by the story and I knew Bas and Jacob would get it together at some point. I’d say the first book is more 4 stars, and this is 3.5, but that doesn’t mean I didn’t highly enjoy both of them!! Glad you’ve had such a great time with this duology, love when that happens! This sounds neat because of it being centered around the Olympics, I think that in itself would make for an interesting read, but the characters also sound interesting and like they each have a good backstory too, so it seems like a well rounded book! Just the sort of cover that puts me off this genre … I know, never judge a book by its cover . Glad you enjoyed both books though I can’t help but wonder if the second suffered slightly from second book syndrome. Glad to hear this was well rounded despite some issues Lauren. The character’s name Bas would just drive me straight up a wall in this book. I know. I have a thing with names. Although if I read the first, perhaps I’d grown more fond of the name/character. I am so picky! I know. EEEKS! haha! Some names are hard to get past. I’m not a huge fan of Bas as a nickname, but I LOVE Sebastian as a name. The excitement of the Olympics must add a great deal to this story. A pinnacle in someones life! Have you read Heels Over Head yet Lauren? It sounds kind of similar and I loved it. I’ve heard good things about Relay but didn’t know there was a second book. I think the Olympics makes an interesting backdrop for this story! It sounds like a page-turner too. I’ve never actually sat and watched the Olympics. Yes, I’ve seen it in passing (it’s impossible not to), or watched a few minutes of this or that, but I’ve never been super involved with it. This does sound like an interesting story! My husband was a big swimmer in high school, so I’ve heard a few stories about what that was like. I’ll definitely look into this one! Thanks! Lindsi at Do You Dog-ear? I think I remember your review of the first book (you reviewed that one, right?). I’m glad this one was a worthy follow-up. Other the back and forth between characters can be frustrating but when it’s understandable and makes sense, that makes all the difference. I have read books with almost all sports but not swimming yet! I will have to look into this one. We have a few kids from back home who swim for our country in the Olympics. I have loved watching them train all year. Thanks for another great review! Look at those arms on the cover!!! haha! I haven’t read anything by this author. Awww, I’m so sad I didn’t request this one. I think I sat there hovering over the button trying to figure out if there was any way I could add it to my seemingly endless pile and get it read in a reasonable time. I’m a big fan of books that have the Olympics as a setting. I bet this would be fun to read while the summer Olympics are taking place. Another commenter said that Bas would drive them crazy while reading the book and I tend to agree. I almost thought it was bras! That sounds fun how it’s set around the Olympics. I vaguely remember I once read an anthology set around the Winter Games which was fun to read. I am not a fan of that type of behavior in books were they push the other away, but it does sound like it makes sense here. Great review!